This blog explains the hybrid mutual funds and the importance they hold for the new investors. Most of the people want to invest their money in an uncomplicated or an uncluttered way where they have pretty less to worry about. For this, the hybrid funds came to life and became a very prominent part of the investment landscape. To understand Hybrid Fund through an easy example, let us consider the game of cricket. Here, we‘re customising the game where we wish to score a century but other than the bowler and the wicketkeeper, we don't wish to have any fielders in the cricket field. It is clear that we’re willing to get a high score or high returns but with lesser chances of getting out or lesser risks. This is what a hybrid fund is all about. It can be referred as a balanced fund that holds a diversified portfolio of different types of securities, be it bonds, stocks, and sometimes money market instruments. A hybrid fund balances your risk-reward ratio by investing in both equity and debt. It is a good starting point for the investors and then when they become comfortable with different asset classes, the manner in which to invest and what it takes to pick the best out of each asset class, they can go ahead with investing in other categories of mutual funds. Hybrid funds are a good practice to follow asset allocation as they allow the investors to invest in funds with a pre-decided asset mix. Say, if someone wishes to restrict his exposure to equity, he can invest in the debt-oriented hybrid funds; which typically have exposure to equity as low as 5% and as high as 25%. So depending upon the comfort level, one can use the debt-oriented hybrid funds. There are also equity-oriented hybrid funds which typically invest around 65-70% of the money in equity and the rest of the money in debt instruments. There are asset allocation hybrid funds as well where asset allocation to different asset classes depends upon the market condition; for example, the exposure to equity would depend upon the status of the market. Further, there are multi-asset funds which invest in debt, gold, and equity. Hybrid funds are beneficial for retail investors as they do not have to re-balance their portfolio which is a key to investment success, as each of these funds has a track as to how much exposure could one have for a particular asset class. For example, if exposure to equity goes beyond a stipulated level, the fund manager will sell the equity shares and increase the exposure to debt. And, if the exposure to equity goes below the stipulated level, then the fund manager will invest more money in that. The information listed in the table above will help investors to compare the funds in the same category in a better way, which will further assist them to identify the right schemes as per their objectives. 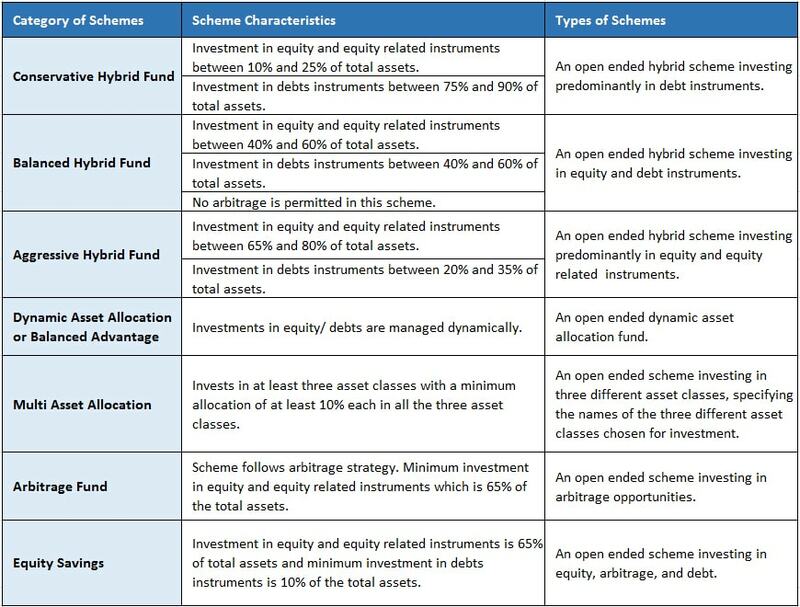 Further, it should be noted that the mutual fund houses can now have only one scheme per category in hybrid fund. In respect of the similar existing schemes as well as those which are not inline with the category that are defined by SEBI, the mutual fund houses would have to complete their course of action like winding up, merger, fundamental attribute change, etc. We hope you have cleared all your doubts concerning this category of mutual funds and are all set to invest in a suitable hybrid fund. If that’s the case, then connect with the experts associated with MySIPonline to seek assistance in the process of investment.